Part personal memoir part Bali travel guide, I put these Bali travel tips together for fun and to help other travelers have as magical of a trip as I did. Also, I want to preface by saying I have never written a travel blog before, let alone a travel guide. Bali got me all inspired to write one so here I go! A lot of people ask me why I chose Bali of all places to travel. I have no clear answer for that other than I felt a calling, so I went with it. It was also one of the places on my bucket list and the timing was divine. I had just gotten out of a breakup and set up my entire business to operate 100% virtually. I knew I wanted to solo travel somewhere and Bali kept popping up for me. So one day I just booked a roundtrip ticket and that was it. I’d figure the rest out later. Or the Universe would. Either way, I just knew it was time. I was definitely a little scared to travel by myself to a country I’d never been before. However, I received so much support from my friends and family, some of whom had traveled there on their own as well. Come to find out, Bali is one of the safest destinations for a woman to solo travel. How perfect! My intention in writing this blog is two-fold: 1) to share my experiences and lessons with you and 2) to provide value to anyone who wants to travel to Bali whether on their own or with others. I am going to kick-off this blog post with a montage video of my trip, share my itinerary and answer some of the most frequently asked questions I’ve gotten. That being said, if you have any questions after reading this, please leave them in the comments below and I will be sure and answer them for you and anyone else who might happen to have your same question. I travelled to Bali November 8-18th which, by the way, was wayyyy too short. If I could redo it over again, I would have stayed much longer. There is so much to see and experience there. Even two more days would have been amazing. Either way, I’m grateful. I had an incredible experience. I spent the first three days in Canggu, which is about an hour and a half from the Denpasar airport. From there, I spent a night and a day in Uluwatu (southern tip), 4 days in Ubud and 1 day in Nusa Penida. According to my extensive research and my polling many of the natives and experienced tourists I met while traveling, the best months to visit Bali are March, April, May, September, October and the beginning of November. The worst times to visit are during the humid rainy season (December through February) and during crowded summer months (June-August). Rainy season technically starts in November but I travelled November 8-18th and the weather was amazing. It rained for maybe an hour in the early morning and an hour in the evening but that was about it. I’d totally go back in November. I recommend to plan to travel throughout Bali for at least 14 full days. You should be able to experience most of the main parts of what Bali is known for within that time frame. The first time I went to Bali, I did not get any shots or vaccinations and I was fine. However, I will be returning in April and traveling throughout South Asia (China, Vietnam, Philippines, Cambodia, etc.) for about three months so I will definitely be getting some travel vaccinations. What I recommend is to Yelp a good travel clinic near you and speak with a trusted doctor about what vaccinations are highly recommended. best friend if you are traveling alone. Even if you are traveling with others, you will want a driver. Plus, it’s incredible affordable. For example, I booked an entire 8-hour day (8am-6pm straight) with my driver and it was only $40 USD. He took me everywhere I wanted to go, showed me some secret local spots and took photos and/or waited for me the entire time. My driver’s name was Made and he was the most amazing, kind-hearted and genuine soul. I arranged him to pick me up from the airport about 2 weeks beforehand and he was my go-to person for my entire trip. Any time I had a question, I WhatsApp’d him and he helped me a lot with deciding where to go and planning my whole trip out. I only booked one 3-night stay at my first stop (Canggu) before arriving in Bali. I did this on purpose because I wanted to be free to move things around if I wanted. I highly recommend doing this, especially if you are not going during high/crowded season. It was really easy for me to book places just a day or two in advance. I even booked one on the day of and was fine. Rates are super affordable in Bali so you won’t have to worry much about that, especially if you are doing Airbnb’s. Bali is super affordable. You can live pretty lavishly on a $100-200 USD per day budget, including your room/Airbnb/hotel stay and food. It is super affordable to stay in Bali and still experience all the things. For example, I stayed at a beautiful villa in the heart of Canggu with my own room, bathroom and a shared communal space between 3 other rooms for just $42 USD per night! Crazy, right? Like I said, super affordable. I loved the shared communal space too since I was traveling alone. I met some really great people and made a couple of instant friends who I ended up going to dinners and doing yoga with during my brief stay in Canggu. It was perfect! Cash is king in Bali. They accept credit cards in many places, however you’ll definitely want to keep a wad of cash on you. Also, when you exchange your cash make sure that you go to a commission-free money exchange. Otherwise they will try and sneak a commission in there if you aren’t paying attention. There are ATMs everywhere too so no worries if you end up needing to take out more cash. Just keep in mind any foreign transaction fees that your bank may charge for ATM withdrawals. The currency in Bali is the Indonesian Rupiah. As of right now $100 USD equals around 1.5 million Rupiah. So yeah, basically you’ll be a millionaire there. Almost all Bali travelers get this at some point. Bali Belly is basically like food poisoning and it mainly comes from the water but can also come from the general change in diet and lifestyle. The severity ranges from person to person. I got it on my third day there and it sucked, however I feel I definitely lucked out compared to some of the other 72-hour nonstop vomiting stories I heard from other travelers. I only threw up off and on in the morning and had bad tummy cramps and pain the rest of the day/night. Oh yeah, I also fainted in the middle of a super crowded tourist bar in Uluwatu that day called Single Fin. That was interesting. I wish I read a blog post on this before traveling! This might be the most useful section of my blog IMO. First and foremost, realize that you are not going to give a rats behind about your makeup or your hair. So just let that go right now. And trust me, it feels super freeing and liberating. You’ll love it. Pack the bare minimum if you like shopping! There are really amazing and inexpensive markets throughout most of Bali, especially Ubud and Canggu. Lots of summer clothing. It’s HOT all day and night, bring easy stuff that you can just throw on. Pack at least 7 or 8 swimsuits. You’ll wear a swimsuit every day. Mark my words. Even if it’s under your clothes. It’s pretty much all you wear 90% of the time. Leave your curling iron, straightener and hairspray at home. Listen, I had a photoshoot in Bali and I STILL didn’t do my hair! The only thing I used was some dry shampoo on occasion as the humidity did make my hair a bit on the oily side. Flip –flops and sandals! That’s all you really need! Water shoes for hiking. You’ll get wet on almost every hike you go on. Honestly, do not even bring tennis shoes or socks… you’ll likely never use them unless you plan to go running every morning. You can use your water shoes for working out. All toiletries (shampoo, conditioner, soap, etc.). Some places you stay won’t have them. ONLY the sweatshirt/jacket you are wearing on the plane and nothing else. I brought 4 too many and never wore any of them, not even once! The only one I wore was a light jean jacket one evening for dinner and that was it. Yoga gear- maybe 4-5 yoga pants and bras. Save the environment and bring a reusable water bottle. Get bug spray as soon as you are there. They have the best kind: Soffell (I like the lotion not the spray). If you get eaten alive like me, I recommend to make some homemade bug spray with essential oils that are less harmful to be putting on constantly. If you’re like me, you’ll need to put on mosquito repellent every couple of hours every single day and right when you get out of the shower/water/etc. Lots of sunscreen and lotions! An Indonesian outlet adapter for your electronics. Anti-diarrhea supplements or medication (i.e., pepto-bismol) just in case. Activated charcoal to flush out system when needed. Let me start by saying that Bali is a LOT bigger than you think. It was definitely much bigger than I realized. That is why I recommend you stay at least two full weeks so you can really experience the top spots and experiences. Here are the best places to go in Bali ranked in order of not just my preference, but of my other friends and experienced travelers that I’ve polled. Also, please note that those I’ve polled have similar interests as me. If you have followed me for a while you know I’m not a huge partier nor do I drink a lot, etc. The order of my list is based on deeply moving and spiritual experiences and adventure. Welcome to the majestic jungle of Bali! Ubud is by far my favorite. It is magical. The vibes, the people, the nature, the beauty, the food… all of it! I recommend to stay at least 4 or 5 full days in Ubud. Desa Visesa Ubud for at least 1 or 2 nights! Great location (only 5 min drive to Ubud center and they have a free shuttle) and absolutely stunning! Amazing service as well. Bali Dacha Spa and Lounge has amazing vibes. Go during the day and on Wednesday evenings for a beautiful night of dancing, making new friends and yummy food! 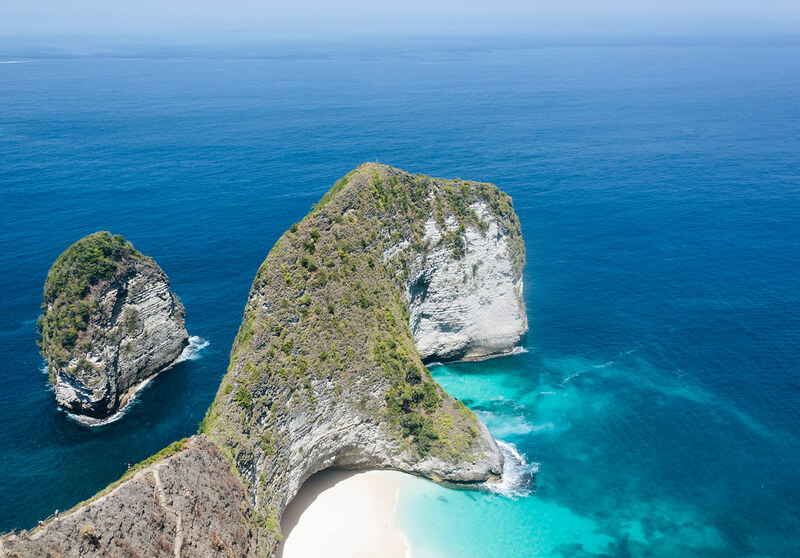 I highly, highly recommend making your way over to Nusa Penida island. You get there by catching a 30 or 40-minute boat from Sanur. If you want to be closer to the harbor where bars/restaurants are then don’t stay there because it’s 30-45 mins out. Go to Kelingking Beach! This is an absolute MUST. If you’re in good physical shape, do the hike all the way down to the beach. It is a little scary, definitely challenging and so worth it! Diamond and Atuh beaches are beautiful white sand beaches with silky blue bay water on the eastern tip of Nusa Penida. Uluwatu is known for its beautiful beaches and more quiet, serene vibes. Uluwatu is more relaxing and quiet, whereas Canggu and Seminyak are more lively and touristy. The beaches are much prettier in Uluwatu in my opinon. La Joya BiuBiu – I highly recommend this hotel. Uluwatu Temple – go earlier when there is less people. Canggu is a touristy beach town. Definitely a bit of a younger crowd. They have a really great selection of Airbnbs on the main strip of Canggu. Echo beach for late night dancing on the beach! This is the “club on the beach” that I refer to in my video. My interpretation of Seminyak (although I haven’t been yet) is that it’s a bit more of a party-town. I hear the clubs are open until 7am. Not really my scene, but I’m sure lots of fun for others! La Favela Restaurant and Bar– I’ve heard many great things about this place. It has come highly recommended by several of my friends. 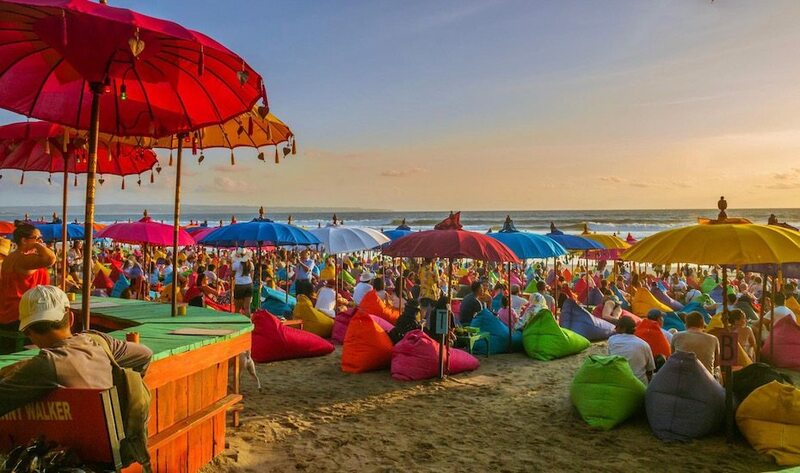 I haven’t been to Kuta but I hear it’s not worth traveling to if you only have a short time in Bali. I would love your input in the comments below if you’ve been and what your thoughts are. #1. Don’t drink the tap water and be careful on where you get drinks on ice or blended drinks. Also be careful with eating raw veggies, salads and fruits that aren’t peel-able. I met a girl who got super bad Bali Belly from eating a salad. I would only eat salads and raw veggies at upscale places just to be safe. Use bottled water when you brush your teeth and be sure to keep your mouth closed when showering. I’ve also heard slowly introducing it into your body via brushing teeth with the tap water can sometimes help prevent Bali Belly. Hmmm. Who knows! #2. Download the apps “Grab” and “GoJek”. These are the best, most inexpensive ways to get around in Bali when you need short rides. GoJek is mainly scooter rides which I’ll be honest, is a bit weird/scary in the beginning. You literally hop on the back of a GoJek drivers bike. You get used to it after a few times of doing it. I’d only use the GoJek scooter rides for 5-8 mins of driving or less. Grab is like Uber and is better for 10+ minute drives. Definitely hire a driver for full day excursions. #3. Get a SIM card when you arrive at the airport. You’ll need a local number to work both of the apps I mentioned above and it’s just handy to have a local number. I did my entire first trip without a SIM card and honestly I wished I had gotten one. #4. If you’re prone to jet lag, start adjusting ahead of time. Personally, I didn’t get any jet lag there but I got it bad on the way back home. Think about getting some “No Jet Lag” homeopathic pills to help reduce/minimize jet lag effects. You can get them on Amazon or Lazy Acres. Pop two every two hours after take-off and in between flights. #5. Make time to go to a spa! I didn’t get to do this on my trip but I definitely will when I go back in April. I hear you can get two hours of various treatments (massage, facial, etc.) for like $40 USD! Um, yes please. Sign me up! #1. Listen to my body and my inner guidance. When things aren’t going “as planned”, it is important not to force it. Instead, surrender my plans and agenda to the Universe and trust that I will be carried and supported. Surrender to flow! #2. Sometimes the biggest growth happens in the scariest places. #3. Trust and let go. Just be. Let go of how I should look or how it should be and just be. #4. When all else fails, come back to my breath. #5. I am whole and complete on my own. I do not need any person, object or thing to complete me. #6. Love whatever arises. Don’t resist anything. Let what comes come and embrace it with love. Wow! I wrote this entire post on a three-hour plane ride. It still does not come close to encompassing all of the beauty and magic that I experienced during my trip.However, I do hope it was valuable to you in some way. Thanks for reading! Please comment any additional questions or comments you have below. I would love to hear from you!